Got the spelling wrong but can't change the title because of the link parties I joined. Banners are cloth (tutorial chalkboard paint banner), pincushion jar (was a copycat) has cloth and poly top and I did use burlap for a runner. Mantel Project, everything included - found around my home, no new cost involved. Pinching a penny. Three little crafts (banner, pincushion jar and candle collars). Creating: six + vignettes. Valentines theme. Valentine mantel is the shelves on my welsh dresser. Its a great place to 'dress' for each holiday and season. I added a chalkboard paint banner with the Goudy Old Style Bold Font printed in white chalk. Used red and white clips to hold the each letter in place. Gathered flowered and spring green china, added the sweet little vintage bisque Kewpie baby. I kept the F A M I L Y white letters as the background for this shelf. Shelf two has blue and white plates, a bit of tarnished silver. One small poinsettia stem in a green wooden caddy. I made the pincushion jar with spools and bobbins with red thread. A tiny crystal bird container borrowed from D. Printed a sweet vintage valentine card from The Graphics Fairy. Then I got fancy. 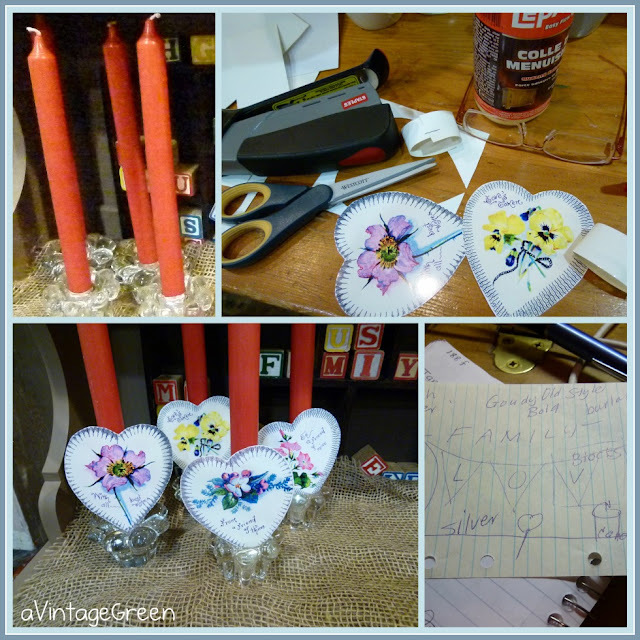 Downloaded some more valentines from The Graphics Fairy and made sleeves for the candlesticks. Quick crafting ideas pop out quite quickly at times. 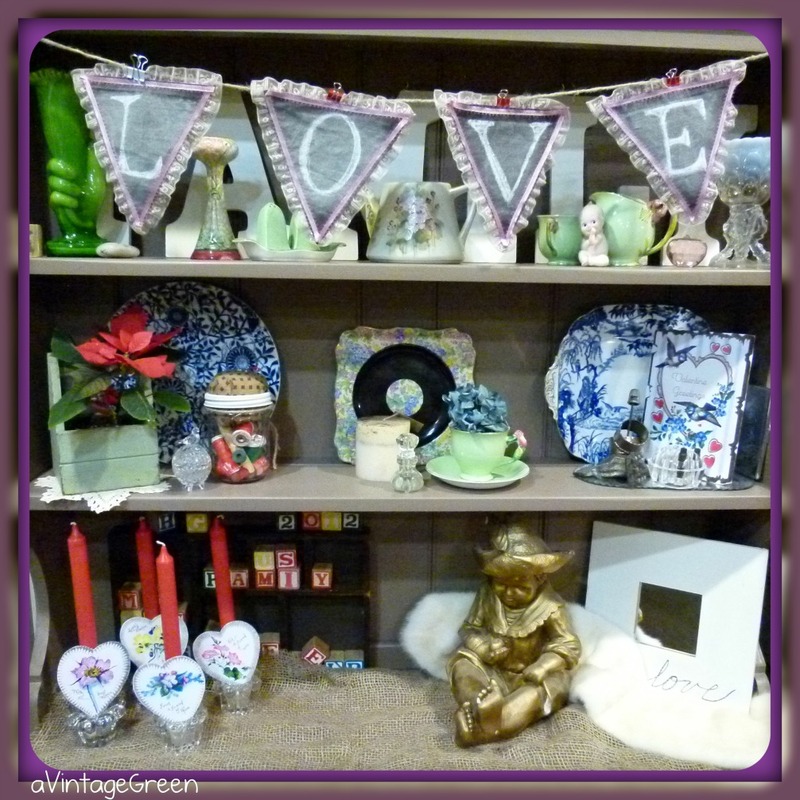 I had sketched out a plan for my Welsh Dresser Valentine shelves and the hearts were a happy add on. I kept the blocks in the dark brown display frame, the words work well with the Valentine theme - family, me, you, us, share, help. Burlap runner. This lovely plaster of a boy holding an apple paired with a fur collar, a mirror with love and a burlap runner seemed to be very romantic. A dried hydrangea blossom in a Royal Winton cup, a Royal Winton Somerset chintz plate, the candle from my sister and two glass knobs made a gentle vignette. Three shelves, each with their own vignettes. I've enjoyed gathering, mixing, making and playing with these shelves. Thank you Picnik for the ease of making collages, frames and adding text. can you believe valentine's day is almost here ALREADY?! it feels like it was just christmas! This is my first visit and am visiting from Bunny Jeans Bunny Hop..I love the hearts and the sleeves you made out of them for the candles..very pretty! I just might "borrow" your creative idea...hehehe. "Well ain't you somethin'!" as they like to say down here. It's just darling! Where do I start? I love the banner, the candles with the cards on them and it all goes together beautifully. I used to have a corner cupboard in my old kitchen that I used to dress up seasonally. I need to do that again! You've inspired me! Thanks! P.S. And I love, love, love the pincushion jar...too sweet! I love your candle sleeve idea, Joy...really gives a festive feeling! I can't believe Valentines Day is just around the corner. What a fun Valentine mantle! Well done. That is so cute! 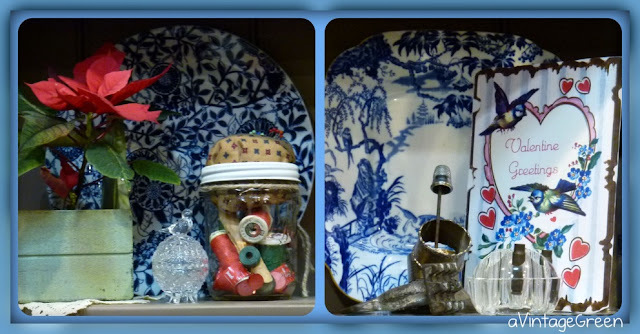 Joy, Love the middle shelf - blue and white is my favorite. You have done wonders pinching your pennies. I love what you did with the candlesticks..too cute! 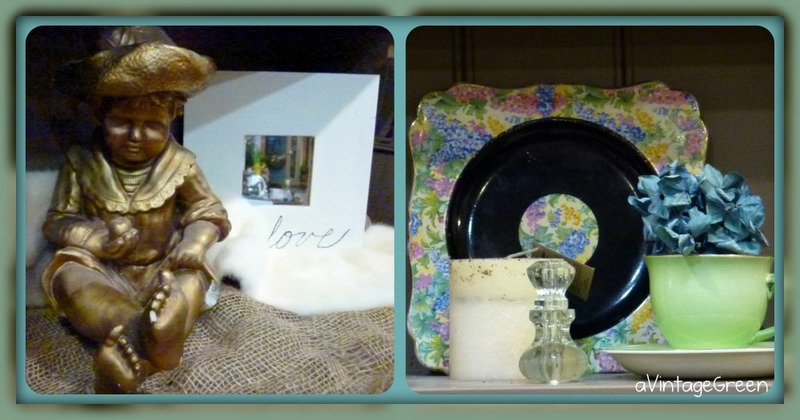 What a wonderful collection of pretty things! Thanks so much for sharing! Love the Valentine's vibe without it being too pink and red! The LOVE pennants are so cute! I love the bit of ruffles around the edges - so fun!